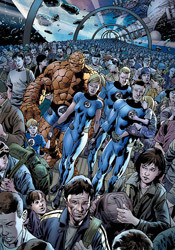 Following their critically acclaimed work together on The Authority and, more recently, The Ultimates, Mark Millar and Bryan Hitch have turned their collaborative attention to Marvel's first family, the Fantastic Four. For Millar, it's somewhat familiar territory – he portrayed the team as teenagers in the inaugural issues of Ultimate Fantastic Four, but it's fresh territory for Hitch, not to mention a more deliberate prod into sci-fi for them both. Their previous work always had that intellectual, adult twitch, but it's been constantly set against the backdrop of a fast-paced action scene. With Reed, Johnny, Sue and Ben, the story's always been much more focused on the act of exploration and adventure than the fight at the end of the road. Fortunately, that fact isn't lost upon Millar, whose writing shifts almost effortlessly to suit the situation. I've found that all of the best F4 stories share the ability to transcend pen and paper, to carry that sense of awe and wonder all the way off the page and into the reader's imagination. In Fantastic #555, it took about six pages to hook me for the rest of the issue. While I'm sure it'll change at some point in the near future, for now this story has no specific villain, no evil force that must be stopped... and the world doesn't stop turning in its absence. If anything, it's twice as interesting because there's nothing to distract me from the weighty concepts at the story's center. If I'd read this book when I was younger, I don't think I'd have enjoyed it all that much. Millar fills the page with big language and heavy ideas. This isn't the bright, cheery squad of adventurers you'll find in the F4 films or cartoons, and in my simple opinion, that's a very, very good thing. While the story is generally lacking in action, (none of the Four even put their powers to use until the last few pages of this issue) it remains a fascinating read. It stands entirely on the strength of its concepts and the characters' reactions to them, and while that's far outside of the norm for a mainstream superhero book, the change of pace is welcome. Bryan Hitch's artwork remains constant from his contributions to The Ultimates. In anyone else's hands, I don't know that the nature of Millar's words would have carried the same weight. Hitch brings a certain validation to this book, which justifies the written word his talent accompanies. He goes a long, long way toward making Millar's high-concept story a much more believable experience. His characters have weight to them, they're muscular, but they don't come off as a cluster of Adonises, either. They look like I have to imagine real people would, if real people spent their days spontaneously engulfed in flame, sailing effortlessly through the sky. The level of detail in his backdrops is one of a kind, simple enough to keep the panels legible and moderately clear, but tightly rendered enough to mesh beautifully with the foregrounds. When he pulls back the camera and allows the scenery to dictate the storytelling, as he does on a few occasions here, there's simply nobody in the world like him. When the Human Torch tackles a mysterious assailant full-force, driving her through buildings, most artists would choose a tight shot of the pair grimacing, flexing and hurling through space. Hitch puts them far in the backdrop, an almost incidental detail in his portrait of New York's evening commute. It's every bit as striking a visual, but it also ties that moment to the real world. As a result of these kinds of decisions, none of his work can be mistaken for pin-ups, (it's simply not something that suits his style) but that doesn't mean they carry any less impact. He's a great partner for this kind of a story and Millar's lucky to have worked with him so frequently. In case you didn't get the picture from what I've said so far, this is some dynamite work. After Ultimates 2 slowed down near the end of its run, I thought about skipping the duo's take on this book, but that's a mistake I plan to correct immediately. I can't recommend you buy this book any more strongly. Millar and Hitch's Fantastic Four is exactly what you'd expect it to be... fantastic.